The slow cooker is a wonderful tool for helping prepare dinner on a busy weeknight, but most recipes are only for the entrée. I love this recipe because it’s for a complete meal in the slow cooker that takes care of itself while I’m at work. All I need to do is come home and serve it. Actually, there’s other one step that makes the ribs prettier, but it’s completely optional.This recipe is a variation of something that my mother made frequently on our stove top. She would cook pork spare ribs on top of the stove in a pot of sauerkraut. The ribs would season the kraut and the saltiness from the sauerkraut would flavor the spare ribs. She always served this dish with some boiled, seasoned, potatoes. Since I had been successful with the slow cooker stuffed chicken and potatoes, I decided to try to make my mom’s spare ribs, complete with potatoes, in the slow cooker. The first thing you need to do is mix up the rub for the ribs, and set it aside. (You could even prepare the rub the night before and store it in a covered container.) 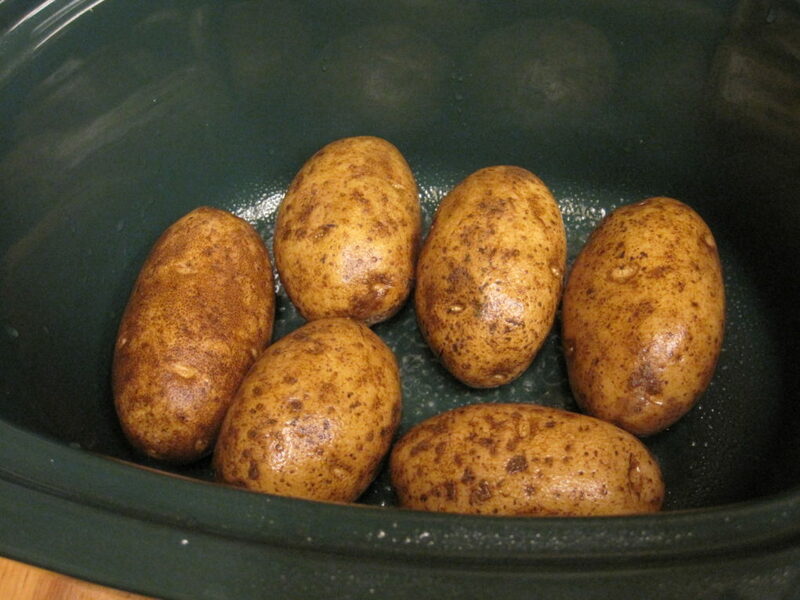 Then, arrange some russet potatoes in the bottom of your crock pot. The potatoes are what hold the ribs up, so make sure you have them spread out across the bottom of the slow cooker. We’re a family of 5 so we used 6 potatoes. A word of warning–don’t use small potatoes. The become over cooked and mushy. Use regular sized russets. Once the potatoes are in the slow cooker, pour an entire jar of sauerkraut over the top, and use a spoon to spread it evenly. Some of it will fall between the potatoes, and this is fine. I like to separate the ribs into serving sized pieces before cooking so that it’s easier to serve. This is something that I usually do the night before, but you can have the butcher do it when you purchase the ribs. 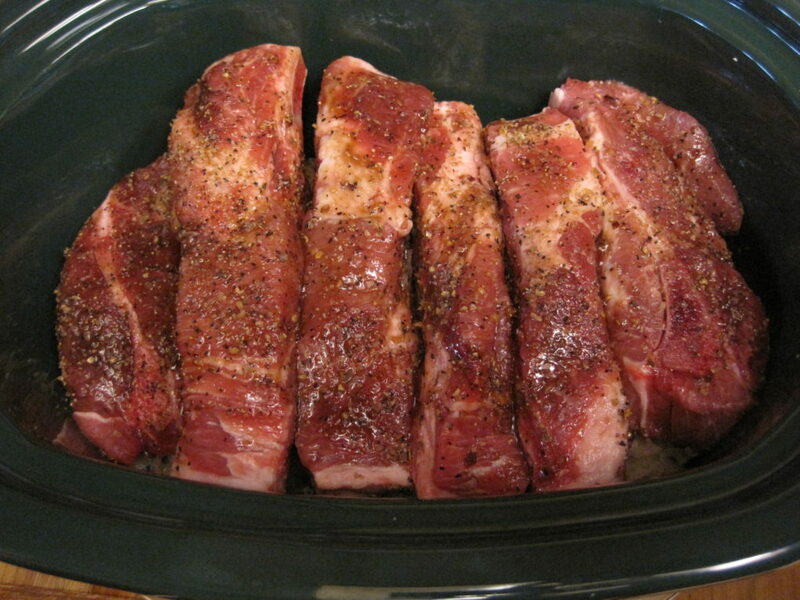 Rub the ribs generously with the spice rub and arrange them on top of the sauerkraut and potatoes in the slow cooker. You really can’t tell from this picture, but we actually had two layers of ribs in the slow cooker. Now, all you need to do is make sure your slow cooker is plugged in, put the lid on top, and turn it on to low for 8 -10 hours. Baker’s Man usually leaves later than I do, so he turns on the slow cooker most of the time, so our ribs generally cook about 9 hours. At the end of the cooking time, everything will look like this. These arean’t very pretty, but they resemble spare ribs of my youth. You can serve dinner and eat at this point, but we go one step further. Mostly, we do this for Sue Chef who is our resident rib lover. We carefully arrange the ribs in a single layer on a foil lined baking pan, removing as much of the sauerkraut as is possible. Be gentle. 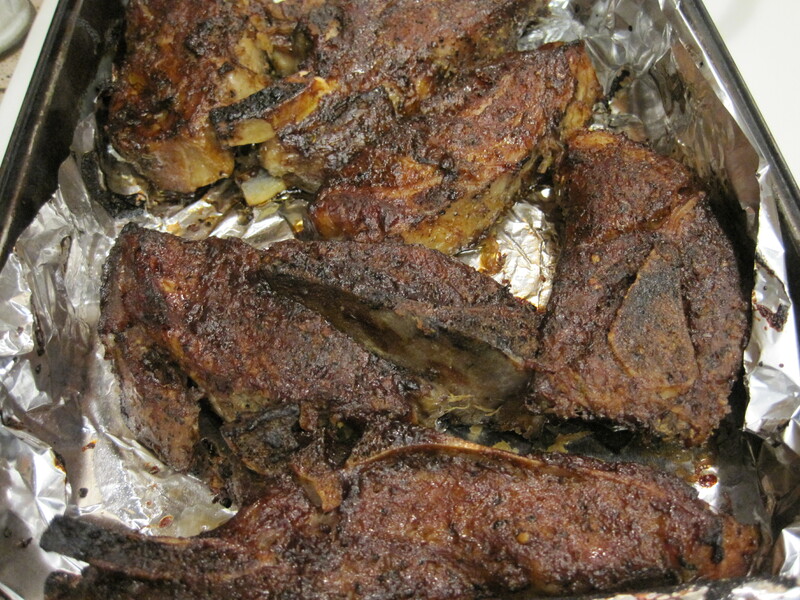 The ribs are very tender and will fall apart if you’re not careful. Sometimes, I just stick these, as is into the oven and broil them for about 5 minutes until they are browned, but on this occasion, Sue Chef requested that we brush them with barbecue sauce. If you want to do this, apply a thin layer of your favorite barbecue sauce–homemade or from the store. Place the pan of ribs under the broiler for about 5 minutes, but watch them closely because there’s a very fine line between browned ribs and burned ribs. When you take them out of the oven, they will look like this. Browning the tops in the oven make these ribs look so much better, don’t you think? All that’s left is to plate your meal. First, remove the potatoes from under the sauerkraut, pat them on a paper, or clean flour sack, towel to remove the excess liquid, then serve the sauerkraut with a slotted spoon to remove excess liquid. Lastly, drop a rib or two onto the plate, and serve with your favorite potato toppings. This is a great meal to come home to on a busy weeknight. Several people have told me that they’re family won’t eat sauerkraut. 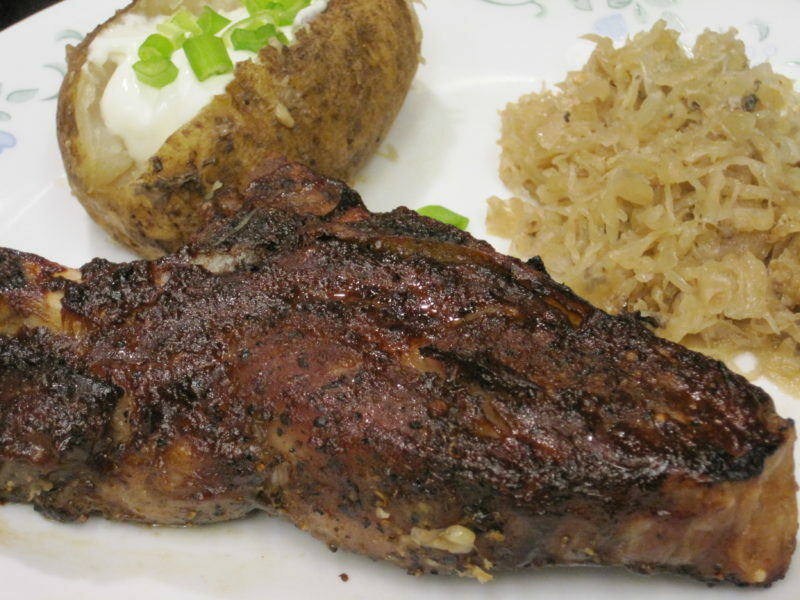 A few members of my family are not big fans of sauerkraut, but because there’s brown sugar in the rub on the ribs, and the ribs are dripping onto the sauerkraut during the cooking time, it helps to temper the flavor of the kraut. Bus Boy refused to eat any of the sauerkraut, but he didn’t complain that it had ruined the flavor of the other foods. In fact, he ate two potatoes, and he has some sensory issues which make him very picky about his food. Give this recipe for Slow Cooker Spare Ribs, Sauerkraut, and Potatoes a try and let us know what you think by leaving a comment below. This classic combination of spare ribs and sauerkraut cooks perfectly in the slow cooker. It's a great meal to come home to after a long day at work. The broth that is left in the slow cooker can be saved to make a vegetable soup on another day. Total Cost of Recipe = 10.57 or about $1.76 per serving. Mix Montreal steak seasoning and brown sugar together and set aside. Arrange potatoes on the bottom of the slow cooker. 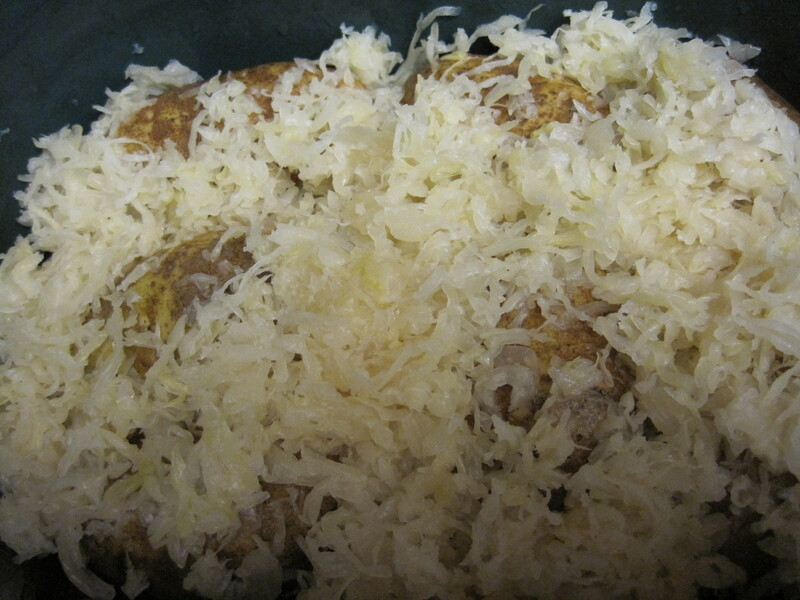 Pour the sauerkraut over the potatoes and spread it out evenly. Rub ribs liberally with brown sugar and steak seasoning mixture. Arrange ribs on top of sauerkraut. Cover slow cooker and turn it on. Allow the food to cook for 8 - 10 hours on low or 4 - 5 hours on high. 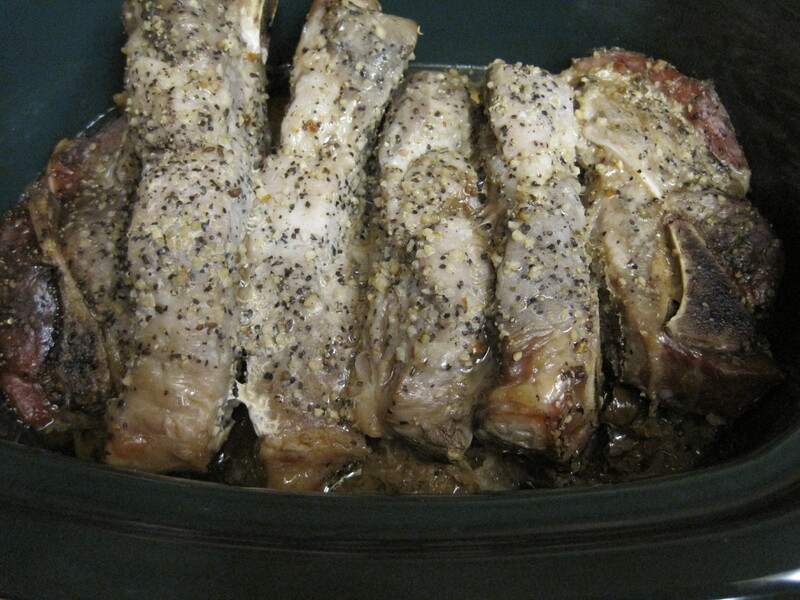 Remove ribs carefully from slow cooker, gently removing sauerkraut that is stuck to them. Arrange ribs in a single layer on a foil lined baking sheet. 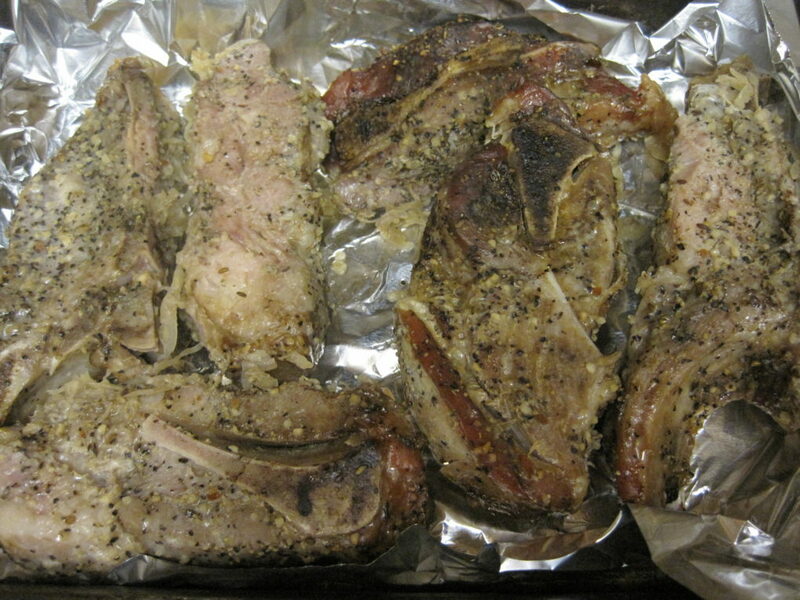 Place under broiler for 5 (up to 10) minutes or until ribs are lightly carmelized. 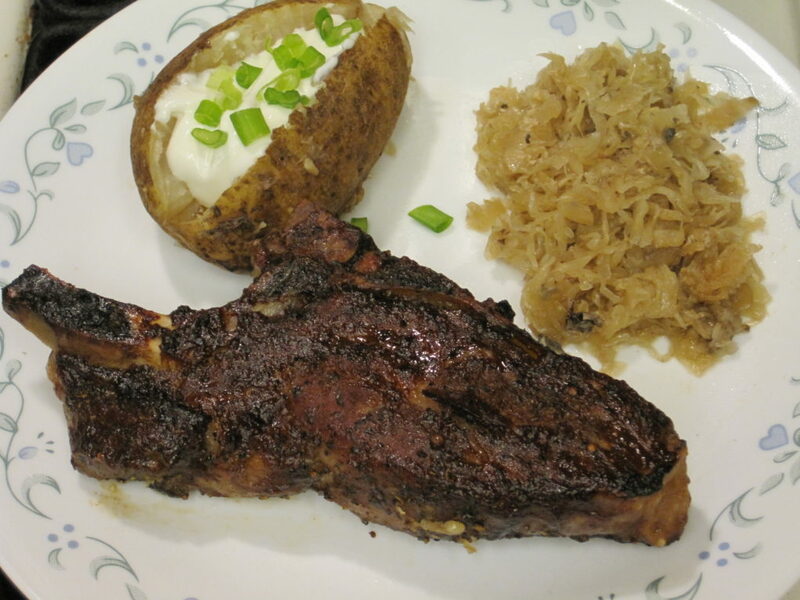 Plate ribs with a potato and sauerkraut that has been served with a slotted spoon. Serve with your favorite potato toppings. Nutrition Information is for a single serving which consists of 1/2 cup sauerkraut, 1 potato, and 4 ribs. Oh yum!! Spare ribs in the slow cooker are the best!! In order to become tender, ribs really need to be cooked for a long time. The slow cooker is perfect for that. My husband will be thanking you soon! I don’t ever make ribs, but I love this meal idea. My husband was skeptical about this recipe, but he really liked it. The slow cooker is the perfect way to make ribs. 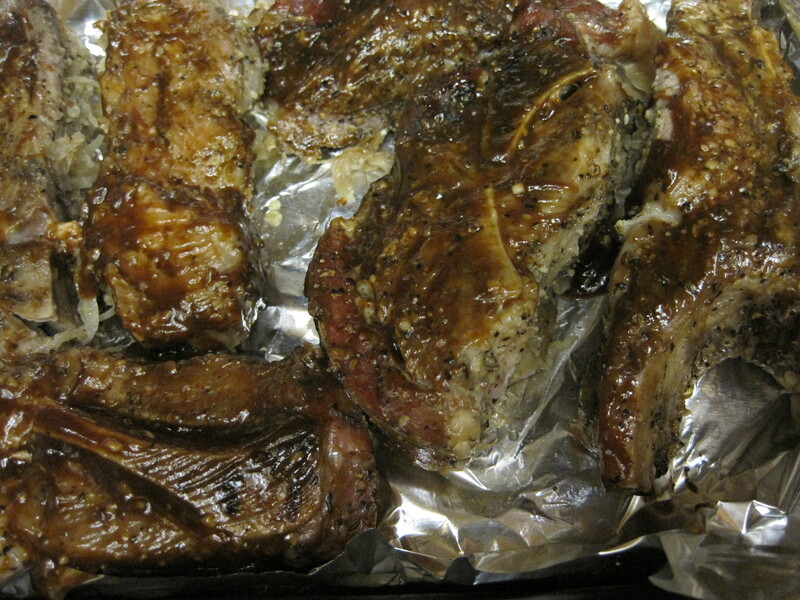 We also do a Dr. Pepper Ribs in the slow cooker that are my daughter’s favorite. Such a great recipe, especially for family gatherings, Patti. What kind of barbecue sauce do you use? Do you have some good recipe for it? For this recipe, I just brushed it with some store bought barbecue sauce. I have several homemade sauces that I make but I thin that I’ve only published the one for my Dr. Pepper Barbecue sauce so far. I better get those sauces published. Do we drain sauerkraut or not? Can’t tell from recipe and MANY other slow cooker ones say to NOT drain, which surprised me as that seems like a lot of liquid for a crockpot. I didn’t drain the sauerkraut because I wanted the saltiness of the brine to seep into the potatoes. Apples with the sauerkraut sounds delicious. They sell a sauerkraut in my local grocer that contains less salt and has wine in it. Let me know how your version turned out. Lori, thank you for coming back to give me feedback on this recipe. I’m glad that you liked it and that the leftovers froze well. I think you might have something there about creating your own products/recipes. There are a lot of recipes with loads of sodium in them. I tried a version of Mississippi Roast, and it was so salty we could barely eat it. We managed the first night by combining bites of roast with bites of unsalted mashed potatoes, but the leftovers had to be boiled and the water drained to remove the saltiness before we could eat the leftovers. I was so disappointed. I really wanted to like that recipe. Patti, I now have to try a recipe before springing on company (unlike my usual, where I would absolutely try a new recipe for the first time with company – why not?) as I cut all added salt WAY down. I have to look at what cheese is added – or other salty items, like capers or worcestershire, etc – as well to determine how much salt I can take away and still have good flavor. One of those meal ingredient services relies WAY too much on s/p at every stage of prep. There are other ways to add flavor, and I can’t handle too much salt, so the testing/tasting continues! 🙂 Glad to see I’m not the only one out there trying to reduce sodium intake. Lori, we used to call a dinner party where we invited people over and made a recipe we’d never tried before “experimental dinners.” I was lucky. I only had one really bad dinner. One of my coworkers has been ordering meal kits from one of those companies, and that company didn’t use too much salt. In fact, one of the recipes she made was crying for salt when she brought leftovers to work to share. I’ll have to ask her which company it was.